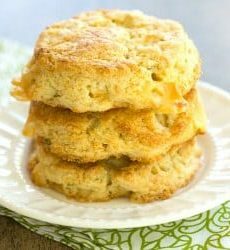 Fluffy cream scones are jam-packed with chopped apple, Gruyere cheese and fresh sage. Add the cubed butter and, using a pastry blender or two knives, cut the butter into the flour mixture until it is the texture of coarse sand and there are no pieces of butter larger than the size of a pea remaining. Stir the chopped apple, Gruyere and sage into the mixture, making sure that everything is evenly coated in flour. Pour the heavy cream into the flour mixture and, using a wooden spoon, gently stir until all of the cream has been absorbed. Turn the dough out onto a lightly floured surface and gently knead a few times to bring the dough together. Pat the dough into a 9-inch circle (it should be 1-inch thick). Using a 2½-inch round cutter, cut out circles and place on the prepared baking sheet, gathering scraps and repeating until no dough remains. Bake until the scones are set and golden brown, about 20 to 25 minutes. Cool on the baking sheet for 15 minutes, then transfer to a wire rack to cool. Serve warm or at room temperature. Store the scones in an airtight container at room temperature for up to 3 days.